Tomb Raider: Bring back Angelina! The Cubs and different coloured Sox finally won World Series. Which means generations of hopelessness is embodied by the Maple Leafs (hey, this is the year!) and the quest to make a good movie based on a video game. And this still isn’t the year for the latter. At least not based on Tomb Raider, the tedious and prosaically scripted reboot of the age-old game, that plays as if someone were literally asleep at the controller. 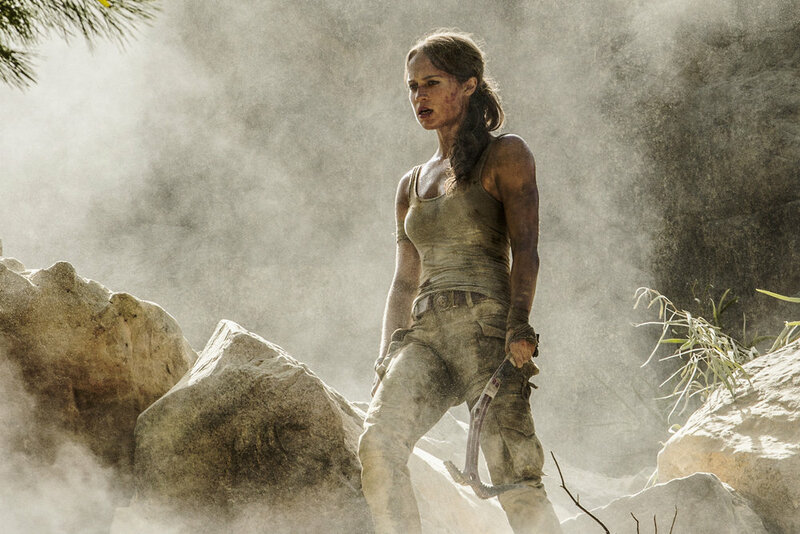 On paper, Alicia Vikander slipping into the jungle-wear of archeologist Lara Croft doesn’t seem like a bad idea. Physically, she’s slighter than Angelina Jolie (whose two turns at the role were arguably as close to success as the vid-game-movie genre has attained, although still no cigar). But though Vikander never been an action star, she managed some chilling menace as a robot in the process of emancipating herself in the terrific Ex Machina. Alicia Vikander as Lara Croft. When the dust clears, there's not much to see here. (Dis)credit the work of Norwegian director Roar Uthaug then, who gives us a Lara whose fallback expression is fear, a scared mouse of a heroine we meet in a mixed martial arts ring (where she loses) and who indeed goes on to get beaten up a lot. She does get to hang by one arm over great heights repeatedly, and make impossible leaps to safety as things collapse. (You could make a drinking game out of Uthaug’s use of those few devices. Throw in people getting hit in the head with rifle butts, and alcohol poisoning will surely result). The movie does start promisingly enough with the aforementioned fight and a serviceable street-race challenge through London with Lara’s fellow bike couriers. Yes, this Lara is a street-rat – by choice. The daughter of corporate magnate/adventurer Richard Croft (Dominic West), she refuses to accept her inheritance because it would involve signing off on his death after nine years missing. Playing with a Japanese puzzle he left her, she follows the metaphorical breadcrumbs and discovers her dad’s secret lair inside the family mausoleum (one of only two tombs in the entire movie, by the way). There Lara finds fake passports and documents pertaining to a secret island tomb of a legendary Japanese princess named Himiko, whose very touch brought death. Oh, and he also left instructions to burn all evidence of Himiko’s tomb, so that it would not fall into unsavoury hands and her power would not be unleashed upon the world. So much for last wishes. What follows is a lengthy expedition to find her dad, complete with a map showing where and how exactly to unleash unspeakable horrors on the world. It’s one of many things that don’t make sense in the script – she could simply have kept the pages that showed where he went and burned the ones that could potentially end the world, thus at least partly acceding to his request. But then the movie would have been much shorter. But then again, that would have been a good thing. (Further on the script, it is remarkably devoid of wit - with the exception of two cameos by Nick Frost, who, I'm guessing, wrote his own lines). Joining her on her quest is a Hong Kong boat captain named Lu Ren (Daniel Wu), whose dad of the same name apparently disappeared with her dad on the same mission to find Himiko. Said corporation uses white guys (including boss Mattias Vogel, played decidedly non-Germanically by Justified’s designated bad guy Walton Goggins) and kidnapped Asian slave labourers to blast away at various mountainsides to find the tomb. This monstrous and expensive operation has been going on all these years because – well, we don’t know. Frankly, I still don’t know, and I’ve had plenty of time to think about it. After some escape adventures and guns pointed at people’s heads (and some more rifle butts to same), villains and heroes alike end up inside the tomb, which is booby-trapped by stuff that I can only assume got thrown out in disgust by the Raiders of the Lost Ark prop shop. And indeed, this Tomb Raider seems like Raiders, if all they cared about was the opening up of the Ark, and they spent most of the rest of the movie just talking about it. I’ve enjoyed Vikander in almost everything, and I still think she’d make a decent action heroine. It may be a while before she gets another chance, though. Tomb Raider. Directed by Roar Uthaug. Starring Alicia Vikander, Walton Goggins, Dominic West. Opens wide Friday, March 16.